Kate Bolduan’s interview with Senator Angus King on "New Day" gives new insight as to why the White House made the deal to trade Sgt. Bowe Bergdahl for five Taliban leaders detained at Guantanamo Bay. PROOF OF PURCHASE: For the first time, White House officials showed senators a “proof of life” video they said justified the exchange. Sen. Angus King, who attended the closed-door meeting, characterized Bergdahl as looking “terrible,” saying the soldier “could barely talk. He couldn't focus his eyes. He was downcast. He was thin.” Most notably, King detailed the dead silence in the room after the 30-second video played, challenging those who say Bergdahl wasn’t as sick as had been let on. LIFE ON THE LINE: King says he understands the urgency behind the administration’s action - its concern that if Congress was notified sooner, leaks might have spoiled the agreement and resulted in Bergdahl’s death. “There was a reasonable chance Bowe Bergdahl would have been killed and that was one of the pieces of information that we learned yesterday that gave it some credence in terms of why it had to be kept quiet so long,” King said. Still, King says it was a mistake not to inform at least limited members of the intelligence committee. IN DEFENSE: King argues two points in the administration’s defense: “What if this deal hadn't been made and the story today was 'American POW dies in Taliban camp and beheaded in Kabul' and the president didn't take a deal that was offered? We’d be having all of the same criticism coming from the opposite direction." Secondly, King said that under laws of war, Taliban officials could be released from Guantanamo Bay when the war in Afghanistan ends. “This may have been the last chance to get Bergdahl where these guys had true value to us as a negotiating tool,” he said. King said that it’s disturbing that people are trying Bergdahl in public and in the media. All eyes are on Russia in the few weeks left before the Olympics begin in Sochi. Athletes and tourists visiting for the games are faced with increasing concerns over terrorist threats in and around what President Putin calls the “Ring of Steel.” Officials there (and here in the U.S.) are already on high alert after recent suicide bombings in Russia killed nearly forty people last month. Congressman Michael McCaul (R-TX), Chairman of the House Homeland Security Committee, was on New Day today and said Russia's security is the "most impressive" in Olympic history. We asked him what he’d tell his constituents if they want to travel to the games. Rep. McCaul didn’t recommend what to do one way or another, but did say we need to realize “nothing is ever safe….I think if we let the terrorists detract us from attending and enjoying these games we’re letting the terrorists win.” He also did acknowledge “ this Olympics is different” because of the proximity of the terrorists to the site of the world event. McCaul says he isn't aware of direct threats against U.S. athletes competing in the games – but, adds "there are threats." His biggest cause for concern: whether Putin will take up President Obama's offer of "full assistance" in added security and technology that can detect and counter IEDs. McCaul says Russia needs to improve its intelligence sharing, saying they haven't been “quite as candid with us." All of this….and we’re just 16 days to the start of the games. Sweet words said from a veteran senior executive producer to a young, fresh anchor producer. Headlines would later make blatantly clear why CNN was sending five of us to England for 35 hours – “WOMAN HAS BABY.” But, more delicately put – the Duchess of Cambridge gave birth to a child and we we’re going to be there...well near there...for the celebration and history-making that would follow. But, more importantly to me, this would be the first time I would follow my anchor to where the news was happening. The first time I could see what it meant to travel the world and contribute to what CNN does best – take you to the story. Now – the part we all hate – the security lines, the bulky carry-on, delays on the tarmac – that was all minimal compared to the anxiety that would hit us like a brick after our very large plane would make a very eager landing at London Heathrow. We had few hours of sleep and a lot to do before our show would start but hours later. Kate changed in the airport bathroom as Marlei, a tape producer, and I coordinated with the London Bureau on transportation to the site. Our EP Jim and Editorial Producer Alexa worked on everything we would have to do once we got there. And, yes, it would be a lot. So, cue London traffic and the strategic thinking. Here you have to fight to keep your eyes open and on your email. No, Lindsay, there would be time later for the the beautiful sights and sounds of a foreign land – I assured myself. First – the Rundown. What guests did we have lined up – what research did we have ready to go. We get to this somewhat muddy but also breathtaking makeshift set staged in front of Buckingham Palace. 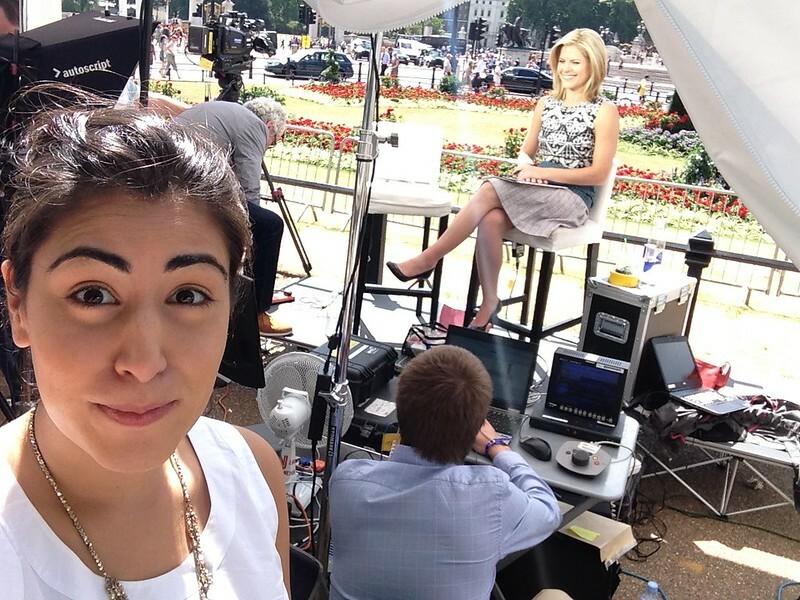 And, sandwiched between NBC and CNN International – our workspace was tight. But, everyone was buzzing. Kate quickly tracked three pieces so editors back home could put together solid packages on what was to come with the #GreatKateWait. You see the waiting wasn’t over – we still needed that first glance at the infant child, the first words from beaming parents, the first (and potentially many middle) names to be. And, Kate needed to be prepared. So, the rest of the day went as such – print research, print scripts. I sat cleverly out of view, right at Kate’s feet. Doing pretty much what I always do during our shows – tell Kate what’s coming up next – help her with questions for our interviews with Royal experts and make sure the intermittent torrential rain didn’t drown us under the flimsy white tent that sheltered us. I guess I don’t always have to do that last thing. But, I promise you there’s a New York set-based equivalent. The show was seamless and we had simple things like a shower and food on our minds. So, we skipped out of there into cars led by very English drivers who said things like “Hello” and, “Where are you going?” Can you even imagine?! On the afternoon agenda – snack, shower and then jet off to St. Mary’s Hospital to tape a piece for the next day’s show. Harvey, our lovely photojournalist led the way to Max Foster – our chief hospital-waiting correspondent (but also much more than that). Max had camped out front since the conception of this baby (well no, but close). He was all smiles and delighted to see us. But, no one was more thrilled than our team when Prince Charles and Duchess Camilla rolled up to check out the newly born infant that had made us all more patient humans. After grabbing the shots we needed – FINALLY FOOD. We fled directly to this amazing Italian restaurant in Notting Hill. Let’s set it straight here and now. Say what you want about British food – and maybe the food wasn’t British – but I never had a more fantastic meal. All was going splendidly until we got some urgent messages from back home. Wolf Blitzer and Chris Cuomo (the two important men in Kate’s TV life) were asking for live shots from Kensington Palace where the Cambridges had just left to with their newborn. So, we wrapped that bread up and made our way back into Max Foster’s arms. Max was already set up in an even more haphazard set – infested with flying gnats? mosquitos? bugs? They were everywhere. Kate promises they flew into her nose and permanently camped out on Max’s head. Either way, we nailed those interviews. Quickly had Kate track some lines for a new Royal Special to air this weekend. (Guys – you have to watch – we ate bugs for this). And, then, you want to know what television producers do when they’re exhausted and spent. They drink. We collapsed in the hotel bar and raised our glasses to a job well done. But, mainly, we raised our glasses to the absolute fact – that we would be doing it all again tomorrow.